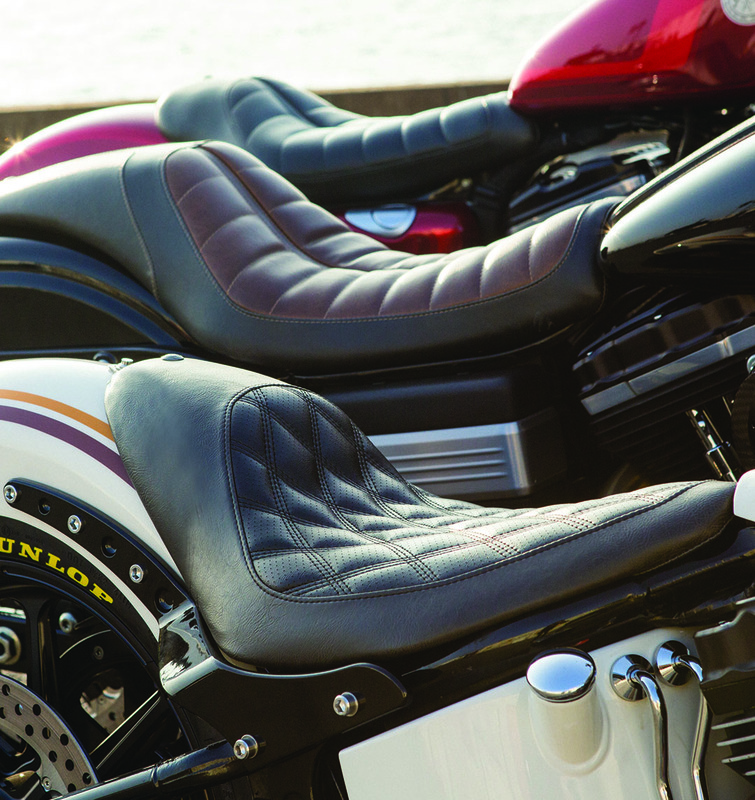 When we set out to build a line of RSD seats we didn’t want to lose sight of what works. It was more about taking what we love about the classic designs and blending it with non-traditional styling. The seat shapes are both comfortable, yet still as thin as we could make them while the patterns push classic design and styling cues. Borrowing from fashion and Italian automotive themes has given us the unique blend we were looking for, with a surprising level of comfort. All the RSD seats were designed by RSD in California and are manufactured with human hands by Mustang Seats in Connecticut. Mustang's quality and finish is unmatched in the industry and represents a true made in America product. 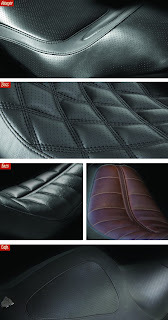 Avenger- Our new Avenger pattern features raised padding with a perforated cover, sewn and formed in just the right places for a comfortable seat. The detailing of the perforated sections add the right amount of style to make it unique yet not overdone. Boss- Our inspiration for the Boss seat pays homage to the art of high end upholstery and fashion. This is not just another diamond seat as is evident in the painfully detailed triple stitch, hand-sewn lines and raised perforated diamond pattern coupled with our unique distressed vinyl. This seat may not make you the Boss, but it will help you get there. 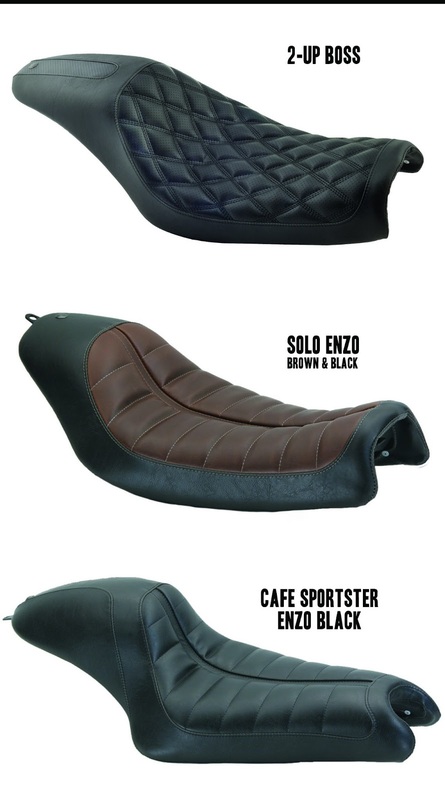 Enzo- Inspired by high performance automobiles and fine leather craftsmanship of the old world, the Enzo seat gives you a high level of detail that pushes design boundaries and the craftsman that assemble the RSD seats. Our shaped foam center part line adds an extra level of detail and comfort on long rides while the classic ribbed detail draws inspiration from the past. Café- The RSD Cafe Sportster seat takes the simple line of a cafe tail and blends it with the tank and frame rails of the stock HD Sportster creating a clean, comfortable and custom detailed seat. 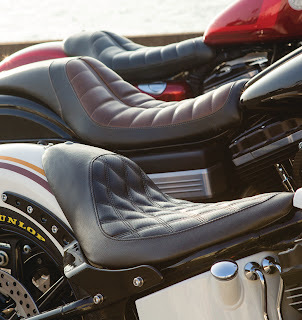 The RSD Cafe seat is the perfect complement to the rest of the RSD cafe line of products and instantly gives your Sportster and aggressive café style rear profile with minimal effort. For addition information, part numbers and pricing, please go to http://www.rolandsands.com/categories/seats and our blog.